If it’s Wednesday, it must be Colombia . . . | A balanced diet . . . If it’s Wednesday, it must be Colombia . . . I have just returned from one of the most hectic work trips I have taken in a very long time. I had meetings in three countries: Peru, Colombia, and Mexico in just over 6½ days. And then, of course, there were four days of travel, from Birmingham to Lima (via Amsterdam), Lima to Cali (Colombia), then on to Mexico City, and back home (again via Amsterdam). That’s some going. Fortunately the two long-haul flights (BHX-AMS-LIM and MEX-AMS-BHX) were in business class on KLM. Even so the journeys from Lima to Cali (direct, on Avianca) and Cali to Mexico (via Panama City, on COPA) were 12 hours and 11 hours door-to-door, respectively, the former taking so long because we were delayed by more than 5 hours. As I have mentioned in an earlier blog post, I am leading the evaluation of the program to oversee the genebank collections in eleven of the CGIAR centers (known as the Genebanks CRP). Together with my team colleague, Marisé Borja, we met with the genebank managers at the International Potato Center (CIP, in Lima), the International Center for Tropical Agriculture (CIAT, in Cali), and the International Maize and Wheat Improvement Center (CIMMYT, in Texcoco near Mexico City). It all started on Sunday 24 July, when I headed off to Birmingham Airport at 04:30 for a 6 o’clock flight to Amsterdam. Not really having slept well the night before, I can’t say I was in the best shape for flying half way round the world. I had a four hour stopover in Amsterdam, and managed to make myself more or less comfortable in the KLM lounge before boarding my Boeing 777-300 Lima flight sometime after noon. There’s not a lot to do on a long flight across the Atlantic except eat, drink and (try to) sleep. I mainly did the first two. It never ceases to impress me just how vast South America is. Once we crossed the coast of Venezuela and headed south over the east of Colombia and northern Peru we must have flown for about three hours over rain forest as far as you could see. I wish I’d taken a few pictures of the interesting topography of abandoned river beds and oxbow lakes showing through all that dense vegetation. At one point we flew over a huge river, and there, on its banks, was a city, with an airport to the west. I checked later on Google Maps, and I reckon it must have been Iquitos in northern Peru on the banks of the Amazon. Over 2000 miles from the Atlantic, ocean going ships can sail all the way to Iquitos. I once visited Iquitos in about 1988 in search of cocoa trees, and we crossed the Amazon (about two miles wide at this point) in a small motorboat. Then the majestic Andes came into view, and after crossing these we began our long descent into Lima, with impressive views of the mountains all the way and, nearer Lima, the coastal fogs that creep in off the Pacific Ocean and cling to the foothills of the Andes. We landed on schedule at Jorge Chavez International Airport in Lima around 18:00 (midnight UK time) so I had been travelling almost 20 hours since leaving home. I was quickly through Immigration and Customs, using the Preferencial (Priority) line reserved for folks needing special assistance. My walking stick certainly gives me the edge these days on airlines these days. Unfortunately, the taxi that had been arranged to take me to my hotel, El Condado, in the Lima district of Miraflores (where Steph and I lived in the 1970s) was a no-show. But I quickly hired another through one of the official taxi agencies inside the airport (necessary because of the various scams perpetrated by the cowboy taxi drivers outside the terminal) at half the price of the pre-arranged taxi. After a quick shower, I met up with old friends and former colleagues at CIP, Dr Roger Rowe and his wife Norma. I first joined CIP in January 1973, and Roger joined in July that same year as CIP’s first head of Breeding & Genetics. He was my first boss! They were in the bar, and we enjoyed several hours of reminiscences, and a couple of pisco sours (my first in almost two decades), and a ‘lite bite’ in the restaurant. It must have been almost 11 pm before I settled into bed. That was Sunday done and dusted. The work began the following morning. I haven’t been to CIP since the 1990s. Given the tight schedule of meetings arranged for us, I didn’t get to see much more than the genebank and dining room. CIP has a genebank collection of wild and cultivated potatoes (>4700 samples or accessions, most from the Andes of Peru), wild and cultivated sweet potatoes (>6400, Ipomoea spp. ), and Andean roots and tubers (>1450) such as ulluco (Ullucus tuberosus), mashua (Tropaeolum tuberosum), and oca (Oxalis tuberosa). 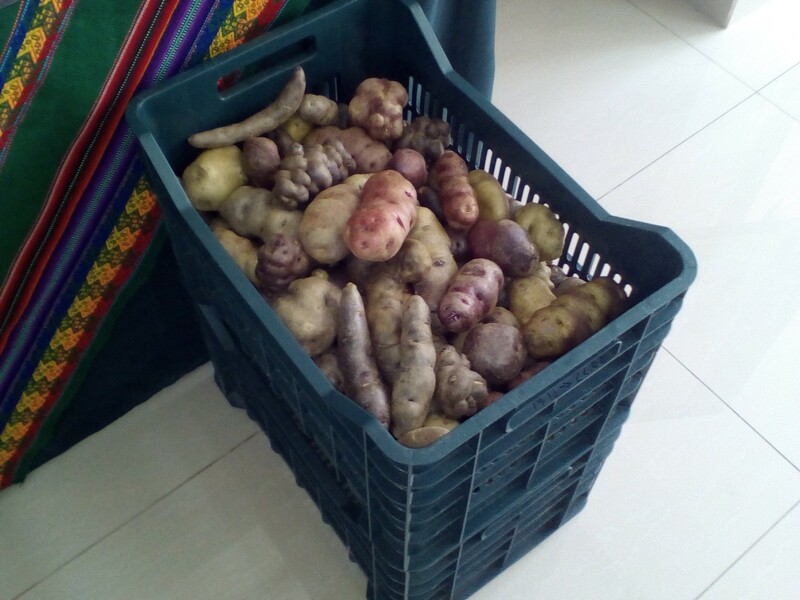 Although potatoes are grown annually at the CIP experiment station at Huancayo, some six or more hours by road east of Lima, at over 10,000 feet in the Mantaro Valley, and sweet potatoes multiplied in greenhouses at CIP’s coastal headquarters at La Molina, the collections are maintained as in vitro cultures and, for potatoes at least, in cryopreservation at the temperature of liquid nitrogen. The in vitro collections are safety duplicated at other sites in Peru, with Embrapa in Brazil, and botanical seeds are safely stored in the Svalbard Global Seed Vault. With a disease pressure from the many diseases that affect potato in its center of origin—fungal, bacterial, and particularly viruses—germplasm may only be sent out of the country if it has been declared free of these diseases. That requires growth in aseptic culture and treatments to eradicate viruses. It’s quite an operation. And the distribution does not even take into account all the hoops that everyone has to jump through to comply with local and international regulations for the exchange of germplasm. The in vitro culture facilities at CIP are rather impressive. When I worked at CIP more than 40 years ago, in vitro culture was really in its infancy. Today, its application is almost industrial in scale. Ana Panta and Rocio Silvestre look after the conservation and distribution of the in vitro collections. Conditioning of cultures ready for cryopreservation. Material being prepared for cryopreservation. Rainer Vollmer leads the cryopreservation work. Tanks of liquid nitrogen in which the cultures are stored. Our host at CIP was Dr David Ellis, genebank manager, but we also met with several of the collection curators and managers. 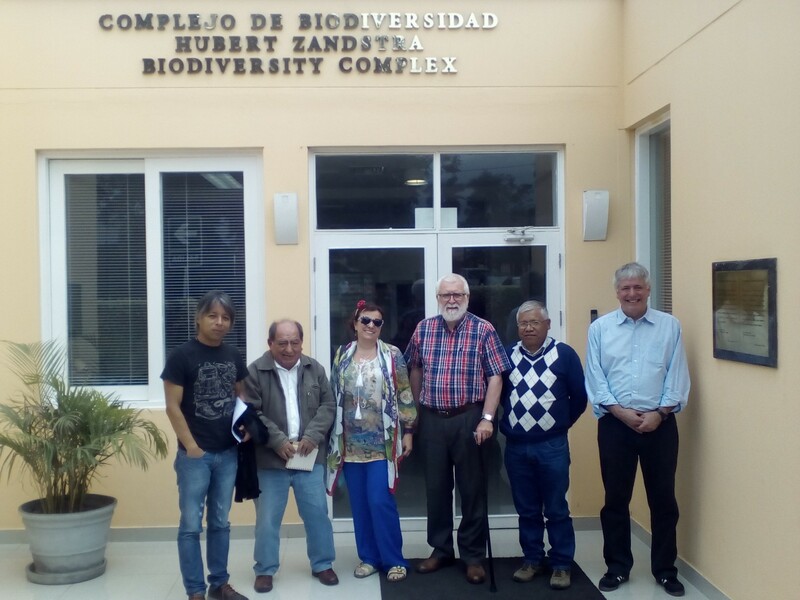 L to R: Ivan Manrique (Andean roots and tubers), Alberto Salas (consultant, wild potatoes), Marisé Borja (evaluation team), me, René Gómez (Senior Curator), David Ellis. Alberto Salas, now in his 70s, worked as assistant to Peruvian potato expert Prof. Carlos Ochoa. Alberto’s wealth of knowledge about wild potatoes is enormous. I’ve known Alberto since 1973, and he is one of the most humble and kind persons I have ever met. Prior to our tour of the genebank, René Gómez and Fanny Vargas of the herbarium had found some specimens that I had made during my studies in Lima during 1973 and 1974. I was also able to confirm how the six digit germplasm numbering system with the prefix ’70’ had been introduced and related to earlier designations. It was great to see how the support from the Genebanks CRP has brought about so many changes at CIP. Lima has changed so much over the past couple of decades. It has spread horizontally and upwards. So many cars! In the district of Miraflores where we used to live, the whole area has been refurbished and become even smarter. So many boutiques and boutique restaurants. My only culinary regret is that the famous restaurant La Rosa Nautica, on a pier over the Pacific Ocean closed down about two months ago. It served great seafood and the most amazing pisco sours. All too soon our two days in Lima were over. Next stop: Cali, Colombia. Heading to the Cauca Valley . . .
Our Avianca flight to Cali (an Embraer 190, operated by TACA Peru) left on time at 10:25. Once we’d reached our cruising altitude, the captain turned off the seat belt sign, and I headed to the toilet at the front of the aircraft, having been turned away from the one at the rear. Strange, I thought. I wasn’t allowed to use the one at the front either. It seems that both refused to flush. The captain decided to return to Lima, but as we still almost a full load of fuel, he had to burn of the excess so we could land safely. So, at cruising altitude and as we descended, he lowered the undercarriage and flaps to create drag which meant he had to apply more power to the engines to keep us flying, thereby burning more fuel. Down and down we went, circling all the time, for over an hour! We could have made it to Cali in the time it took us to return to Lima. We could have all sat there with legs crossed, I guess. Once back on the ground, engineers assessed the situation and determined they could fix the sensor fault in about a couple of hours. We were taken back to the terminal for lunch, and around 15:30 we took off again, without further incident. But as we waited at the departure gate for a bus to the aircraft, there was some impromptu entertainment by a group of musicians. Unfortunately because of our late arrival in Cali, we missed an important meeting with the CIAT DG, who was not available the following days we were there. CIAT was established in 1967, and is preparing for its 5oth anniversary next year. Daniel Debouck, from Belgium, is CIAT’s genebank manager, and he has been there for more than 20 years. He steps down from this position at the end of the year, and will be replaced by Peter Wenzl who was at the Global Crop Diversity Trust in Bonn until the end of April this year. Daniel is an internationally-recognised expert on Phaseolus beans. The CIAT genebank has three significant collections: wild and cultivated Phaseolus beans (almost 38,000 accessions), wild and cultivated cassava (Manihot spp., >6600 accessions in vitro or as ‘bonsai’ plants), and more than 23,000 accessions of tropical forages. Here’s an interesting fact: one line of the forage grass Brachiaria is grown on more than 100 million hectares in Brazil alone! The bean collections are easily maintained as seeds in cold storage, as can most of the forages. But, like potato, the cassava accessions present many of the same quarantine issues, have to be cleaned of diseases, particularly viruses, and maintained in tissue culture. Cryopreservation is not yet an option for cassava, and even in vitro storage needs more research to optimise it for many clones. Mónica Lorena Vélez Tobón is the research assistant for in vitro conservation, and she was checking several cultures from each accession for any contamination. Excising tissue for in vitro culture. Preparing samples for long term conservation. Inside one of the cold stores. 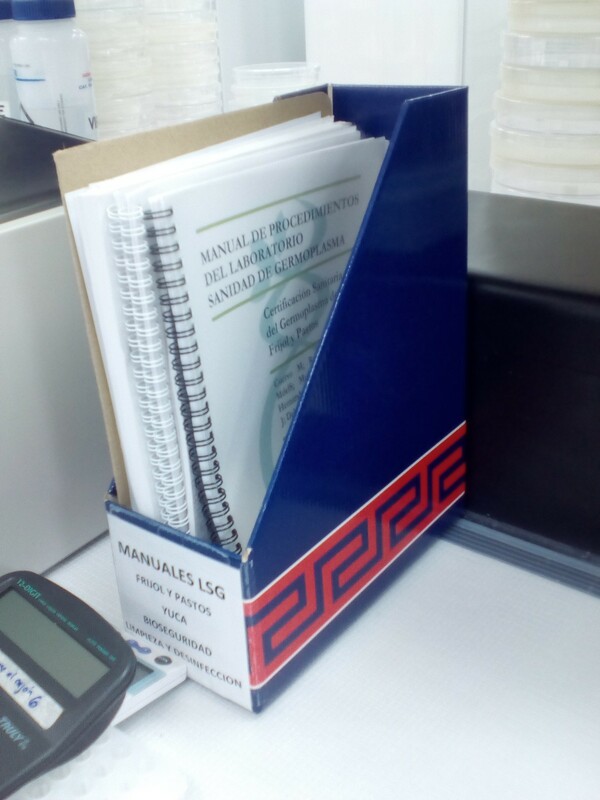 QMS manuals in the germplasm health laboratory. Like many of the genebanks, CIAT has been upgrading its conservation processes and procedures through the application of a Quality Management System (QMS). A couple of genebanks (including CIP) have opted for ISO certification, but I am of the opinion that this is not really suitable for most genebanks. Everything is documented, however, including detailed risk assessments, and we saw that the staff at CIAT were highly motivated to perform to the highest standards. In all the work areas, laboratory manuals are always to hand for easy reference. An exciting development at CIAT is the planned USD18-20 million biodiversity center, with state of the art conservation and germplasm health facilities, construction of which is expected to begin next year. It is so designed to permit the expected thousands of visitors to have good views of what goes on in a genebank without actually having to enter any of the work areas. On our first night in Cali, our hosts graciously wined and dined us at Platillos Voladores, regarded as one of Cali’s finest restaurants. We had the private room for six persons with all the wine bottles on the wall, which can be seen in this photo above. On Saturday afternoon around 15:30, we headed to Mexico City via Tocumen International Airport in Panama City. Cali’s international airport is being expanded significantly and there are now international flights to Europe as well as the USA. This must be great for CIAT staff, as the airport is only 15 minutes or so from the research center. After takeoff, we climbed out of the Cauca Valley and had great views of productive agriculture, lots of sugar cane. Tocumen is lot busier than when I was travelling through therein the late 1970s. With several wide-bodied jets getting set to depart to Europe, the terminal was heaving with passengers and there was hardly anywhere to sit down. On our COPA 737-800 flight to Mexico I had chosen aisle seat 5D immediately behind the business class section, so had plenty of room to stretch my legs. Much more comfortable than had I stayed with the seat I was originally assigned. I eventually arrived to CIMMYT a little after midnight. CIMMYT is the second oldest of the international agricultural centers of the CGIAR, founded in 1966. And it is about to celebrate its 50th anniversary in about 1 month from now. IRRI, where I worked for 19 years, was the first center. Unlike many of the CGIAR centers that have multi-crop collections in their genebanks (ICARDA, ICRISAT, and IITA for example), CIMMYT has two independent genebank collections for maize and wheat in a single facility, inaugurated in 1996, and dedicated to two renowned maize and wheat scientists, Edwin Wellhausen and Glenn Anderson. But CIMMYT’s most famous staff member is Nobel Peace prize Laureate, Norman Borlaug, ‘Father of the Green Revolution’. Mural of Anderson and Wellhausen inside the genebank. Tom Payne and Denise Costich are the wheat and maize genebank managers. CIMMYT’s genebank has ISO 9001:2008 accreditation. 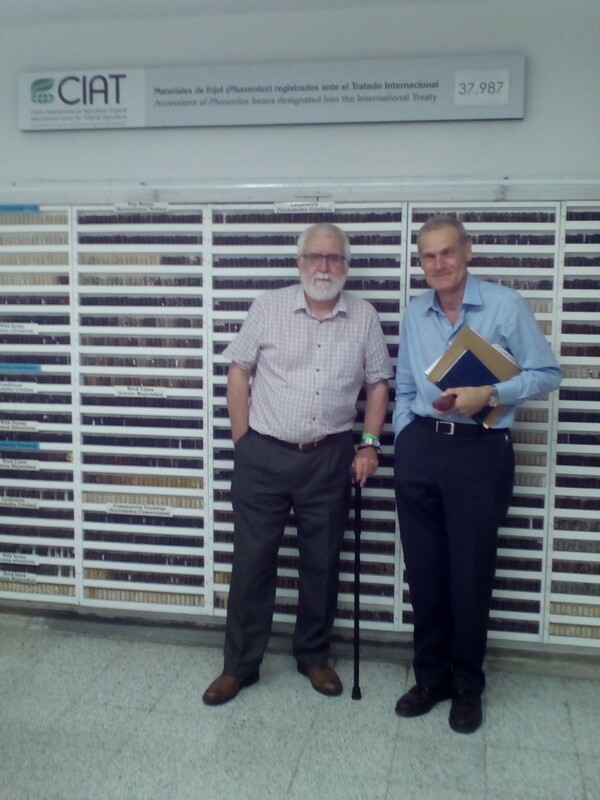 Tom has been at CIMMYT in various wheat breeding capacities for more than 25 years. In addition to managing the wheat genebank, Tom manages the wheat international nurseries. One of the first curators of the wheat collection was Ayla Sençer from Turkey, and a classmate of mine when we studied at Birmingham in 1970 for the MSc in Conservation and Utilisation of Plant Genetic Resources. The CIMMYT wheat collection is unlike many other germplasm collections in that most of the 152,800 samples are actually breeding lines (in addition to landrace varieties and wild species). Denise joined CIMMYT just a year or so ago, from the USDA. She has some very interesting work on in situ conservation and management of traditional maize varieties in Mexico and Guatemala. 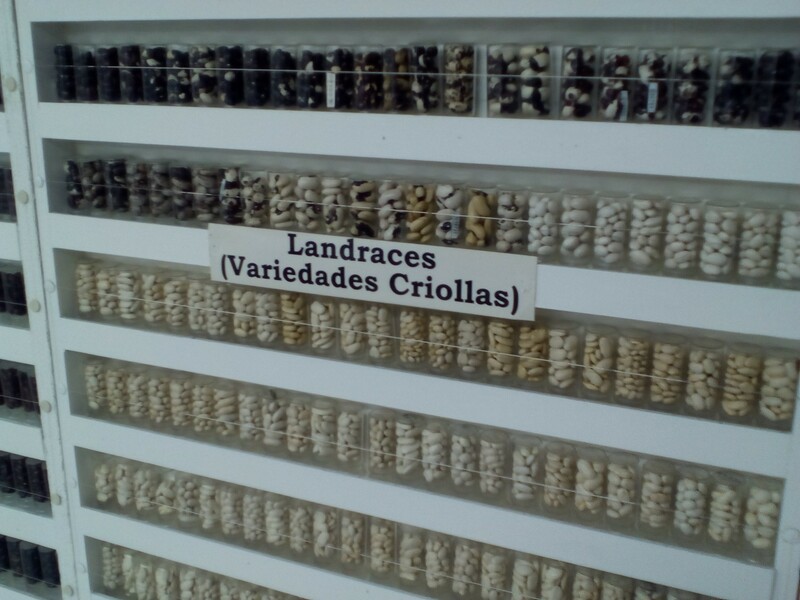 A particular conservation challenge for the maize genebank is the regeneration of highland maizes from South America that are not well-adapted to growing conditions in Mexico. The maize collection comprises over 28,000 accessions including a field collection of Tripsacum (a wild relative of maize). Entering the genebank – using face and card recognition. The medium-term storage vault, with wheat on the left, maize on the right. Denise shows a maize sample. In recent years has received major infrastructure investments from both the Carlos Slim Foundation and the Bill & Melinda Gates Foundation. New laboratories, greenhouses and the like ensure that CIMMYT is well-placed to deliver on its mission. And the support received through the Genebanks CRP has certainly raised the morale of genebank staff. On our last day at CIMMYT (Wednesday), we met with Janny van Beem from the Crop Trust. Janny is a QMS expert, based in Houston, Texas, and she flew over to Mexico especially to meet with Marisé and me. When we visiited Bonn in April we only had opportunity to speak by Skype with Janny for jsut 30 minutes. Since the implementation of QMS in the genebanks seems to be one of the main challenges—and success stories—of the Genebanks CRP, we thought it useful to have an in-depth discussion with Janny about this. And very useful it was, indeed! On the previous evening (Tuesday) Tom, Denise, Marisé, Janny and I went out for dinner in Texcoco, to a well-known tacqueria, then into the coffee shop next door afterwards. No margaritas that night – we’d sampled those on Monday. L to R: Janny, me, Tom, Marisé, and Denise. But on this trip we did have one free day, Sunday. And I met up with members of CIMMYT’s Filipino community, many of them ex-IRRI employees, some of who worked in units for which I had management responsibility. They organised a ‘boodle fight‘ lunch, and great fun was had by one and all. Hasta la vista . . .
At 6 pm on Wednesday I headed into Mexico City to take the KLM flight to Amsterdam. It was a 747-400 Combi (half passengers, half cargo). I haven’t flown a 747 for many years, and I’d forgotten what a pleasant experience it can be. It’s remarkable that the 747 is being phased out by most airlines; they are just not as economical as the new generation twin engine 777s, 787s, and A350s. With the new seating configuration, I had a single seat, 4E, in the center of the main deck forward cabin. Very convenient. I was glad to have the opportunity of putting my leg up for a few hours. Over the previous 10 days my leg had swelled up quite badly by the end of each day, and it was quite painful. The purser asked if I had arranged any ground transport at Schipol to take me from the arrival to departure gates. I hadn’t, so she arranged that for me before we landed. The distances at Schipol between gates can be quite challenging, so I was grateful for a ride on one of the electric carts. But after we went through security, my ‘assistant’ pushed me to my gate in a wheelchair. I must admit I felt a bit of a fraud. An electric cart is one thing, and most welcome. But a wheelchair? Another was waiting for me on arrival at Birmingham. Go with the flow! I was all alone in Business Class from Schipol to Birmingham. We were back at BHX on time, and I was out in the car park looking for my taxi home within about 20 minutes, and home at 6 pm. Now the hard work really begins—synthesising all the discussions we had with so many staff at CIP, CIAT, and CIMMYT. For obvious reasons I can’t comment about those discussions, but visiting these important genebanks in such a short period was both a challenging but scientifically enriching experience. This entry was posted in Out and about, Travel and tagged beans, cassava, CGIAR, CIAT, CIMMYT, CIP, Colombia, genebanks, genetic resources, germplasm conservation, Global Crop Diversity Trust, maize, Mexico, Peru, potato, South America, sweet potato, travel, tropical forages, wheat.